The Marian Hall is a new facility, built in 2008. 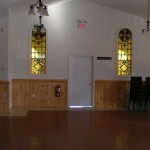 It is a large room for gatherings and special events. There is a small kitchen area with a sink and coffee maker. There are also washrooms. 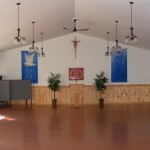 The Marian Hall can be accessed through the Parish Centre but also has a ground floor entrance off of the parking lot for the Parish Centre (located next to the tennis courts). If you would like to see about renting the hall, please contact the office at 742-7151.